Yes, it’s time to bust out all the warm pieces! Please allow me to introduce my new favorite cashmere brand: W. Cashmere! I currently have two pieces that I’ve received as a gift from the brand — one sweater named “TRICIA” and another named “ELLIE” — and I’m in love with both of them! Not only do I love the designs, but I also adore the soft, soft material. In this post, I’m sharing two looks I put together, featuring ELLIE! You can use TRICIA30 to get 30% off the sweater ELLIE on www.wcashmereshop.com; only valid from November 7 to 9, 2018. W. Cashmere sources quality materials from the Pamir Mountains, the original birthplace of cashmere. Designed in Los Angeles, every piece by W. Cashmere is ethically made and sustainable. Their sweaters are now the elevated essential staples in my winter closet! You can learn more about the brand on Once Upon’s blog site. Cashmere works well in the office because there is a certain level of sophistication to the material that makes it very office appropriate! The cut of ELLIE is also simple and clean, nothing too complicated, which is why it’s so easy to throw on and style. Here, I’m wearing it over wool pants and a pair of silver booties. 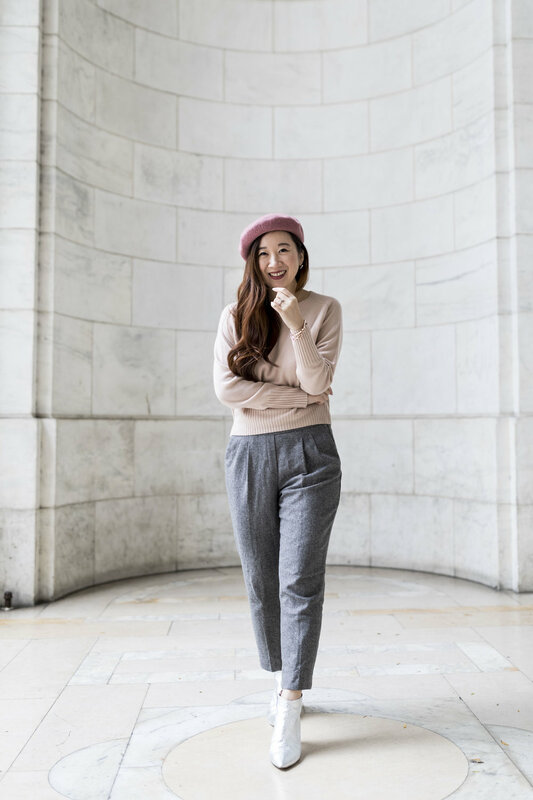 Use TRICIA30 to get 30% off the sweater ELLIE on www.wcashmereshop.com; only valid from November 7 to 9, 2018. I love monochromatic outfits, wearing the same color head to toe, because you can never go wrong with that combination! I think this outfit works great for those days when I have events to attend and want a little “something extra.” I paired the rose beige ELLIE with my soft pink tulle maxi skirt and added a pink wide belt. To avoid making this look too wedding guest-like, I put on my dad sneakers (which makes walking around the city a lot easier, too!). Which look do you like more? How would you style this cashmere sweater? Let me know by leaving a comment below!